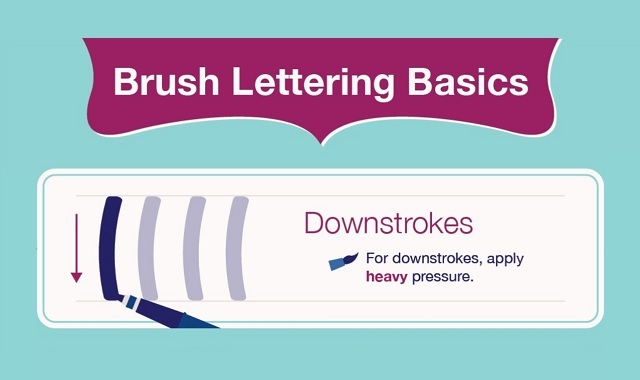 Brush Lettering Basics #infographic ~ Visualistan '+g+"
Handwriting is back in fashion. Typography dominated the design world for many years, but recently, hand-drawn lettering, also known as brush lettering or calligraphy, has made a huge comeback. You’ve probably seen hand-drawn letters on movie titles, magazine covers, book covers, wedding or party invitations and advertisements, as well as on your friends’ Instagram and Pinterest pages, and it’s no wonder. Lettering by hand is an amazing way to create unique, one-of-a-kind pieces of art. A beautifully drawn word, phrase, or quote has the power to evoke strong emotions.You don’t need to be a professional artist or illustrator to create beautiful handwritten lettering. Modern brush pens make calligraphy accessible, affordable, and fun. Brush lettering takes a little practice, but soon you can craft beautiful brush-lettered creations.